Among the various different ethnic groups that live in the province are first and foremost Han Chinese majority, all immigrants from the Central Chinese Plains. Major nationalities The Han make up 84% of the population in Liaoning Province. Among the other Ethnic Groups are first and foremost the Manchu, contributing 13% to the total of 42.4 Million Citizens of the Province. The third ethnic group in Liaoning Province, the Mongols, is considerably smaller. The Mongols make up only 2% of the total. The rest are the Hui with 0.6%, the Korean Ethnic Minority or Chaoxian with only 0.6% of the population. 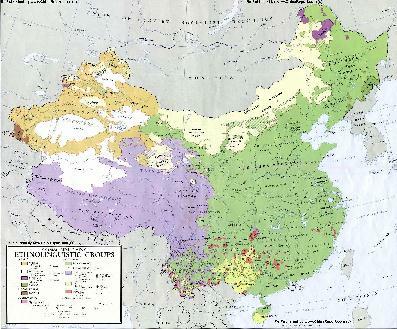 As can be read from adjacent Map of all Ethnic Language Area's in China ((Ethno-Linguistic Map), the Ethnic Manchu Communities in Liaoning Province can mainly be found in the extreme North East, in the Changbai Shan Mountain Range and the border area's with Jilin Province and the Nation of North Korea. The 6Th and last Minority Group the Xibe Tribal People rank a puny total of only 0.3% of the provincial population. Liaoning Province is the Most Northern of China's 9 coastal Provinces lying in the upper North-East of the country, above Hebei Province at the Bohai Sea. 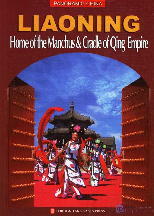 Liaoning is one of the three Provinces that make up the Manchuria Region. Neighboring Provinces and Nations are in clockwise direction - Inner-Mongolia Autonomous Region in the West and North-West, Jilin Province to the North and North-West, The Nation of North-Korea bordering in the South-East and finally, Hebei Province in the South-West to close the list. The Topography of Liaoning Province can general be seen as follows - The Center of the Province, those area's in a wide circle around the Provincial Capital of Shenyang are part of the Manchurian Plains. The Central Province has only Few Hills and no Mountains. to 1600 Meters. The entire region is dominated by low hills. In the west lie highlands and the Peaks of the Nulu'erhu Mountains which roughly follow the border between Liaoning and Inner Mongolia Autonomous Region. Although the Great Wall of China's main Inner Defense layer ends just across the Hebei Province Border at Qinghuangdao, a lesser known extended arm and outer defensive layer of the Great Wall extends Northward through Liaoning Province and the Hills in the extreme West of Liaoning. Shenyang, Anshan, Benxi, Dalian, Dandong, Fushun, Jinzhou, Xingcheng and Yixian. Even more Information on LiaoNing Province - Soon !! 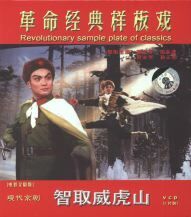 "Liaoning - Home o/t Manchus - Cradle o/t Ching Empire"
Sound Bonus - Fisherman's Song of the East China Sea. "Taking Tiger Mountain by Strategy"
Schematic Map depicting the multiple layers of the Great Wall of circling Beijing and North and North-East China. (outer layer) in China mark the border with North-Korea. Here, some 15 kilometers North of Dandong City, the Great Wall on Tiger Mountain looks down onto the Yalu River and North Korea. North of Tiger Mountain and the Great Wall the Yalu River runs down from Sup'Ung Lake and Reservoir forming another natural border with The Democratic Republic of Korea (North Korea). A mountainous ridge extends South from the Qian Shan Range and Anyang to form the Liaodong Peninsula, a large outcropping of the Province that reaches into the Bohai Sea. Especially the City of Dalian on the Southern Tip of the Liaodong Peninsula is known for its greenery and golden sands. The central part of Liaoning consists of low lying plains through which run a number of rivers. The Main Rivers of Central Liaoning Province are the Liao He' - which gives its name to the Province, The Daliao He' and their tributaries. The Liao River originates as two streams, one that runs from the extreme North-West from Inner-Mongolia AR to the Center of the Province, and one, the eastern stem, that rises from low mountains in central Liaoning and is known as the Dongliao He (=Eastern Liao River). Two more Rivers, Hun He and Taizi He, join the Liao River in the Manchurian Plain near Shenyang and eventually the Liao River runs to the Coastline near Yingkou and into the Bohai Sea. In the East the Yalu River runs down southward from the Changbai Shan Mountain Range and through Sup'ung Lake and water reservoir to the Dandong City on the Coast, forming a natural border with the Nation of North-Korea (D.P.R.K.). A Satellite Image based Map of the the North-Eastern (Manchuria) Chinese Province of Jilin (with parts of Liaoning Province), the Chinese-North Korean Border, Part of Russian Primorsky Krai (Maritime) Province of Siberia in the Russian Federation, and the Nations of North Korea (DPRK) and South Korea (DRK) on the Korean Peninsula. 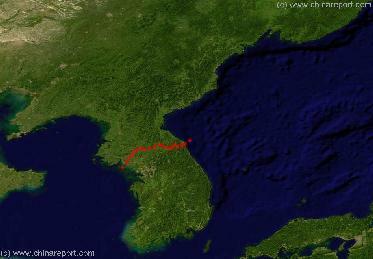 - Mouse over Map to Reveal Chinese-North-Korean Border. Climate in Liaoning Province is less extreme to the more Northern Manchurian Provinces of Jilin and Heilongjiang, where especially winters are frigid, frosty and full of abundant snowfall. In General, as a coastal province Liaoning enjoys a more Temperate, more humid, monsoonal climate customary in coastal area's and regions. The climate is subtropical and semi-humid, with a more monsoonal climate in the north of the Province. The range of temperature is from -15 degrees in Winter to 35 degrees Celsius in summer respectively. Average Temperatures in Januari range from Minus 17 to minus 5 Celcius. Spring Time in Liaoning is the most windy Time of the Year. Spring in Liaoning comes late and is short. Summers are hot and humid in Liaoning. The rainy season extends from late May through the Month of July well into August. Some 60 percent of the rain falls from June to August. Annual average rainfall is 400 to 1200 mm. The most rain falls in the Eastern mountain area's. Since 2004 AD changing climate conditions have seen a drought in all three North-Eastern (Manchurian) Provinces of the Peoples Republic of China, giving holiday goers in Liaoning some extra beach time. Agriculture and City water companies however suffer from a severe lack of water (2009 AD). Currently rain-sowing techniques are being applied in an effort to increase rainfall in agricultural zones in Liaoning. Map of the Language Distribution in China (Ethno-Linguistic) delineating the most languages in each individual Province and/or Territory of China (PRC). Search the Map to select your autonomous region, area or town and click through for more information ! In the 19Th Century during the Colonial Era the North-East of China was hotly contested among various Nations. Although at first the Qing Dynasty of China managed to have its influence felt, after the Fall of the Feudal Dynasty and the Revolution of 1911 AD the Region slowly but surely fell out of Chinese control. By 1896 AD the first Sino-Japanese war had already defeated the Ching Dynasty in the North-East and afterwards the Russians and Japanese were left to contest the Korean Peninsula and Manchuria, including Liaoning. The Chinese Port of Lushun (south of Dalian) on the extreme end of the Liaodong Peninsula was an attractive open water part and had been extorted from China as a treaty port open to all Nationalities since the year 1860 AD and the second Opium War. Not much later it was claimed by Russia as the base of its Pacific Fleet. 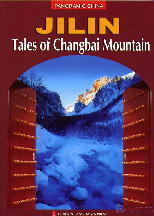 "Jilin - Tales of Changbai Mountain"
During the beginning of the 20Th Century much of Manchuria including the territories of today's Liaoning Province were under the control of either the Russian Military and leadership, or under control of Japan. With the humiliating defeat of Russia in the Russo-Japanese War (10 February 1904 AD – 5 September 1905 AD) Japanese influence over the Three North-Eastern Provinces known as Manchuria won out over any Russian efforts. Not long after, around the year 1910 AD the Japanese Army defeated the Ching Dynasty Army at Pyongyang driving China from the Korean Peninsula. In the ensuing period the Japanese Army entered Liaoning in attempt to grab control of all of Korea as well as Manchuria. Thus the entire North-East was annexed by the Japanese Empire, turning it eventually into the Puppet State of Manchukuo and starting a reign of terror and destruction that would last until the final Japanese Capitulation in 1945 AD. By that Time the Russian Army had belatedly joined the fight against Japan in the East, now easily claiming Manchuria and the Northern part of the Korean Peninsula as its "spoils of war". 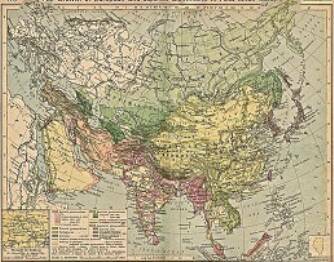 Map of China and the British Empire in Asia in 1860 AD, after the second opium war. Depicted are Treaty Ports along the Chinese Coastline including Port Arthur (Lushun k'ou). Flag of the Democratic Peoples Republic of Korea, or North Korea (DPRK). Flag of the Republic of Korea, or South Korea (ROK). 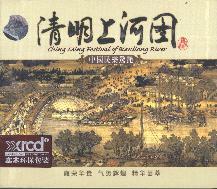 "Ching Ming Festival at BiangLiang River"
many people are drawn from the country-side into the main cities of the Province in search of jobs, better lives and education, expecting to raise the urbanization rate to over 63% of the Total. Between 2006 and 2010 the province expects to have 10 cities with a population of 200,000 to 500,000, and 10 more smaller cities with a population of 100,000 to 200,000. The Largest City in Liaoning Province is Shenyang with roughly 7.2 million citizens closely followed by Dalian as the second largest city with 5.9 million inhabitants. Anshan is the third largest city in the Province. Dandong City on the North Korean border measures only roughly 2.4 million souls. Among the smaller cities in Liaoning Province are Fushun - north-east and near Shenyang, Jinzhou, Xingcheng and Yixian. Liaoning was one of the first provinces in China to industrialize. At the very beginning in the 1890's there was the construction of the Trans-Siberian Railway with its Chinese Southern Branch named the South-Manchurian Railway connecting from Haerbin down south to Shenyang and Dalian and Porth Arthur in the extreme south. At first the mining sector and logging dominated the industries and transportation within the Manchurian Territories. Later however, under Japanese occupation more and more industries were set up, mainly based on the raw materials provided by the exploration of Manchuria. After the establishment of the Peoples Republic of China large and ambitious 5 fear programs were launched by the Party and agreed on by the Peoples Parliament and Standing Committee turning the North towards a dive on heavy Industrialization. First established in the 1950s and entrenched by the 1960s, North- East China and Liaoning Province became the Center of China's Heavy Steel and related Industries. As one result the city of Anshan is home to one of the largest iron and steel complexes in China. After the downfall of communism worldwide and the so called opening-up policy that was introduced in 1985 AD, the inefficient heavy industries of the North have seen huge challenges. Profitably became the key word as large groups of workers were quietly layed off and industries privatized and transformed. Although some major industries remain essentially in state hands and subsidized, those factories that have managed to modernize now rank among the top producers in the Nation. In recent years this early focus on heavy industry has become a liability, as many of the large state-run enterprises have experienced economic difficulties. Recognizing the special difficulties faced by Liaoning and other provinces in north-east China because of their heritage of heavy industry, the Chinese central government launched a "Revitalize the Northeast" Campaign in 2003 AD seeing massive infra-structure projects to unlock various cities and regions, reaping some success creating local jobs, industry and overall development of the Region. The securing of natural gas supplies vital for the national economy has been an important factor in this revitalisation program. Liaoning Province is currently ranked the eighth province in China when it comes to economic productivity in terms of GDP. To Find out More - Read the Full Economy of Liaoning Province - CLICK HERE ! The Highlights and Scenic Spots of Liaoning Province are truely too many to mention. Dependingon taste, their is the modern City of Dalian - the Hong Kong of the North and naturally the Capital of Shenyang, for those seeking the City high-life. Those in need of a holiday on the Beach best refer to coastal cities on either the Liaodong Peninsula or along the South-Western coastline of the Province. Mainstays of Tourism in Liaoning are the former Qing Dynasty Imperial Palace a sprawling estate located in the old quarters of the City of Shenyang. The much appraciated sites of the Province are mainly located in the East, where Fenghuan Shan and Tiger Mountain carry the Great Wall of China along their ridges. The Ultimate East Terminus of the Great Wall of China outermost layer starts with the beacon tower atop the Tiger Mountain then winds west through Liaoning and around Shenyang City to disappear over the Nulu'Erhu Mountains in Western Liaoning Province into Inner-Mongolia Autonomous Region where it ends somewhere far North-East of Hohhot in the Gobi Desert. Holy Mountains in Liaoning amount to mere Hills, but there are two options to chose from. The Qian Shan, which is easily accesible from Anshan City, and the Fenghuan Shan, which lies at some distance traveling Wset out of Dandong City on the North Korean Border and near the Yellow Sea Coastline. The highest Mountain in Liaoning Province is Mount Huabozi - HuaBozi Shan, which with a mere 1336 Meters announces the more Northernly Changbai Shan Mountain Range. Although there are some Ethnic Minority Members and their communities to be found in Liaoning Province, the main communities of the Manchu Nationality lie just across the Border inside Jilin Province near Siping City and in Yitong Manchu Autonomous County of Siping Prefecture. For the Full Story, Read - Highlights, Scenic Sites and Monuments of Liaoning Province - Click Here !! Main Railroad connections through the Province run from North to South but there are many more train tracks available throughout this well-connected Province. The main North-South line was first created in the early 1900's as a convenient connection between the newly constructed Trans-Siberian Railway to the North in Russia and the warm water harbor (open water year round) of Lushun k'ou (Port Arthur) in the South at the tip of the Liaodong Peninsula. It became known in history as the South Manchurian Railway. The construction of this railroad for the first time opened up these vast and remote lands to travel and industrial size transport, creating new cities and settlements along its length. In the following century, the Manchurian region - with especially Liaoning would see an unprecedented economic boom, terrible suffering and wars over its natural riches and an influx of new migrants, Chinese and Foreign alike. What remains is history and a vast network of railroads criss-crossing Liaoning Province. For the Full Story on the Ethnic Groups in Liaoning Province, Read - Ethnic Minorities of Liaoning Province - Click Here !! The Best Chinese Traditional Music of the Yang Qin. 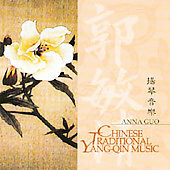 - The Yang Qin traditional instrument played by true master Anna Guo. (http://twitter.com/chinareportcom1) for near LIVE Reporting by DrBen & China Report Staff & their Mobile Devices (ChinaReportcom2 & ChinaReportcom3). from Harbin in Heilongjiang Province far in the North through Changchun in Jilin Province to Shenyang and then Dalian in Liaoning Province. Apart from the Main South-Manchurian Railway running from Siping Border City with Jilin Province in the North to Dalian Port City in the South, There are two more main railroad branches traversing the province. The second of main railroad-branches in Liaoning Province is another historic line constructed in the early 20Th Century. This Line runs from Tianjin City Province in the South-West across the border into Liaoning Province and on to Shenyang (Mukden). From Shenyang the railroad then turns South-Eastward to connect through Benxi and Fengcheng to Dandong on the border with North-Korea. Those with a valid Visa and passport can continue on the Line to Pyongyang, the Capital of North Korea. Historically the line continues even further, through Seoul to Ch'Ongju where it split up to travel to Pusan or Kwangju and Mokp'o. However since 1949 AD the line through North-Korea has been closed. Continued tensions on the Korean Peninsula have made travel impossible for the foreseeable future. A Third main railway line in Liaoning Province runs from Shenyang to the North-West through Fushun to Haihekou on the Border with Jilin Province and then onwards. In Jilin Province the line cuts through the central province passing the towns of Meihekou and Panshi to either connect to Jilin City or Dunhua in North-Eastern Jilin. To be precise: the stations in this line inside Liaoning Province include Suizhong and Huludao on the Coast of the Bohai Sea in Liaoning Province, Jinzhou, Xinmin and Shenyang. Then Fushun and Haihekou. More, local railway lines connect various cities across the Province. Especially the Western Province has its own local network, with inter-connections between Chaoyang and neighboring cities and towns. Rails from Chaoyang connect Westward to Jianping and onwards, East to Beipiao and through to Fuxin or Jinzhou, etc. 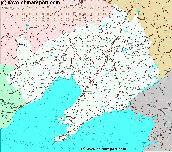 In the south Dalian is locally connected to Lushun, Jinzhou and then Pikou on the Gulf of Korea. Help tell the Story of Liaoning Province, shop for Music Online ! CLICK HERE FOR FULL MAP ! 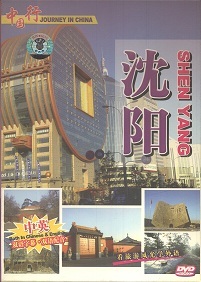 "Journey in China - Shenyang"
Discover China in all aspects with ChinaTravel2.0 ! Culture, Food, History, ethnic minorities and off the beaten path locations and sites to visit - China Travel 2.0 has it all and thus offers and brandnew eco-oriented way of travel within the Peoples Republic. Join DrBen.net & AsiaReport.com exclusive partner for your Travels in China and join a learning experience of your choice !! Included in this Map are the main cities across the continent with their brief histories and events during the 19Th Century. 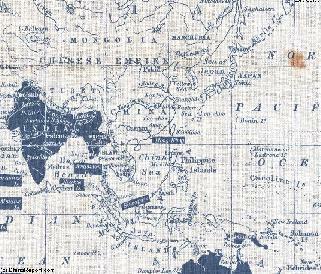 Marked in Colors for clarity are the various colonial and imperialist Nations. As relating to China; special attention is payed to so called Treaty Ports. The First Treaty Ports were forced open by Britain in the year 1841 AD, but counted over 80 in total by the end of the 19Th Century. The most important Treaty Ports in China are marked and described with a short history where the map allows. Parade was held for Chairman Mao Zedong upon the Taking of Beijing, after which soon no option was left to the so called National Government to take up its priced possessions and flee to the Island of Taiwan (Taiwan remains de facto independent from mainland China (PRC) today). Liaoning did not exist prior to 1954 AD. When the People's Republic of China was founded on October 1st of 1949 AD there were two provinces called Liaodong and Liaoxi existing along with a variety of City Provinces such as Shenyang, Luda, Anshan, Fushun and Benxi. In this period, the Korean War or conflict (1950-53 AD) occurred and the North-Eastern Provinces, especially what is now Liaoning Province, became the target of the American airforce interdicting Chinese supply lines that supported the North Korean Army and Chinese Volunteers (CVA) in the field on the Korean Peninsula. In this period many railway yards throughout the region were attacked from the air, and starting the 2nd of November of 1950 AD, the American airforce - first with the P51 Mustang later with the F-86 Sabre Jet Aircraft - was in a continued battle for control of the skies above the province. The airspace over the flow of the Yalu Border River with North Korea would become world renowned as "Mig Alley". Effective in 1954 AD all these territories, Liaodong and Liaoxi plus independent cities were merged to form Liaoning Province. A Year later, in 1955 AD, the current day Province became complete when Parts of the former Rahe province were added to Liaoning Province. Although Liaoning Province annexed parts of the Inner Mongolia Autonomous Region during the politically tumultuous days Cultural Revolution (1960/63 AD to 1976 AD). These sections have been returned to the Mongolian People and the Inner Mongolia Autonomous Region, reversing what was obviously an ill inspired idea. To Find out More - Read the Full History of Liaoning Province - CLICK HERE ! 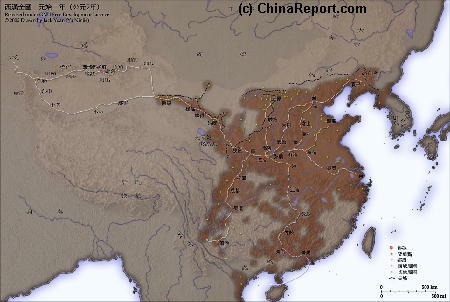 Many new roads and highways have been constructed in Liaoning Province since roughly the year 2000 AD. Currently the main feature is a ring of highways encircling the City of Shenyang. Nearby cities of Xinmin, Tieling, Fushun, Benxi and Liaoyang are connected through highway arms extending from this circle. Main directions of the Liaoning Province road network consist of direct highway connections to the South-West and to the South-East. The south-west link leads from Shenyang, the Provincial Capital in Central Liaoning Province through the province to the coastal city of Qinhuangdao in the extreme south-west, just across the provincial border in Hebei Province. From there it connects through to either Beijing (Hebei Province), or via Tangshan to the coastal City Province of Tianjin (Hebei Province). The South-East highway link leads from Shenyang to Liaoyang, Anshan to Haicheng and Gaixian. Between the last to cities an interconnection exist leading along the coastline to connect up with the South-West main highway route above the Coastal City of Jincheng. From the City of Gaixian, a highway leads around the Liaoning Peninsula, following the Coastline and passing Jingxian and Zhuanghe' after which it leads to its end at Dandong City on the North Korean Border. The third arm extending from Shenyang, leads directly through Benxi and Fengcheng to Dandong City in the extreme south-east. The 4Th arm and last main highway route leads roughly northwards out of Shenyang to lead to Changchun in Jilin Province. This branch travels through Tieling and Kaiyuan in Liaoning and Siping City in Jilin Province. 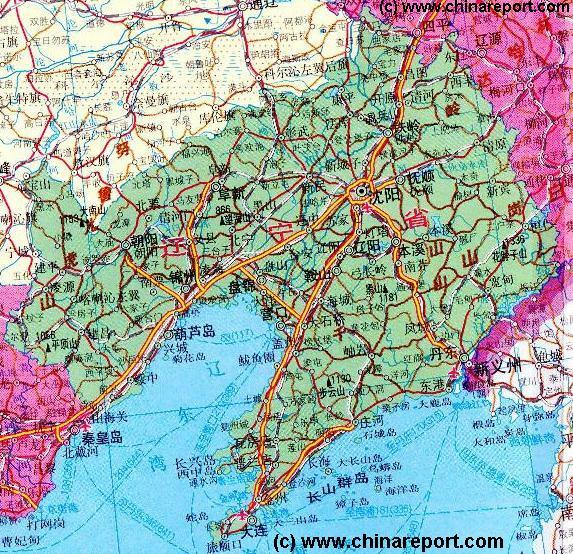 For more details and Roads & Rails in Liaoning Province refer to Liaoning Province Map 2A Schematic - or Read "Public Transport in Liaoning Province" - CLICK HERE !